Frontline is a band that I didn't even know existed until I reviewed their newest album, Against The World last year. That album still receives regular play in my CD player. However, I had reservations about this album when I first heard about it. You see, Almost Unreleased contains three new songs, previously unreleased tracks, and Japanese bonus tracks. Therefore, I was afraid that these songs were merely "leftovers" and somehow not worthy of placement on a regular album. Well, my misguided reservations were quickly dashed upon first listen to this melodic hard rock jewel…. The three new tracks are all uptempo rockers: My Innocence, No one Like You, and I'll Be There For You. All three pick up right where Against The World left off with their winning formula of catchy melodies and wonderful song structures. If this is a sign of things to come, the next Frontline album will deliver the same high quality of melodic hard rock the band has become known for. For hard rock and AOR fans who have not yet discovered Frontline, this would be a great place to start. 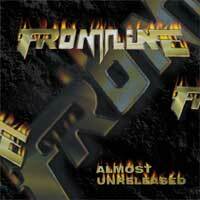 Frontline plays an excellent brand of guitar driven hard rock. Stephan Kaemmerer offers a colorful and melodic vocal delivery (not too far from that of Ted Poley), while the music itself is uplifting and jam packed with melodies. The keyboard sound is very big, but fits within the structure of the songs very nicely. The guitars are still at the forefront of the sound, while the keyboards enhance the climatic moments of the songs. Careful attention is placed on production as the instruments and vocal lines are at the perfect levels, making the CD very easy to listen to and enjoy. I am also very impressed with the guitar work of this band. The rhythm work and soling of Robert Böbel certainly adds a lot of color to the songs. From the first track to the last, Almost Unreleased is a fair representation of the band's classy, addictive sound. This is NOT an album full of leftover scrap! You are getting three new tracks (all of the uptempo variety), previously unreleased tracks, tracks previously available in Japan only, and a live version of Endless to close the album. All songs are very worthy of the Frontline name as the quality level remains high throughout the album. Highly recommended or fans of the band as well as those looking to discover an excellent melodic hard rock / AOR band.